In our latest Snapshot survey, 58% of Storage readers say they’re using tape as much or more than they did three years ago and only 16% have banished tape entirely. Let’s skip the “tape is dead” rhetoric and get down to facts: 58% of Storage readers use tape as much or more than they did three years ago and only 16% have banished tape. That’s not to suggest disk isn’t bigger than ever in backup, but it’s not even close to sending tape to the showers for good. Forty-nine percent of respondents use disk more in their backups than they did three years ago, while 11% don’t use any disk at all in their backup ops. Regardless of the mix of disk and tape, 80% say that eventually all or some of their backup data winds up on tape. 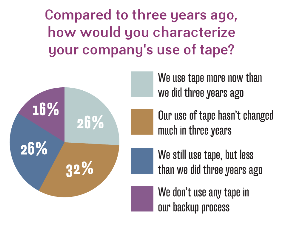 Most firms (60%) will leave backups on disk for 30 days or less before spinning them off to tape. Tape clings to its backup role, but it’s not the only one it’s good at; 37% use tape for non-backup apps, like archival (83%) and nearline storage to augment disk (28%). It doesn’t look like the tables will turn too much for tape next year, as one-third of those surveyed expect to buy some tape gear in the coming year.